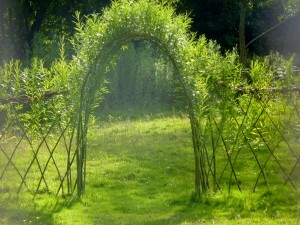 We specialise in Living Willow Installations and were amongst the pioneers of Living Willow in Britain. Our work has been featured on television and in the Gardening press. 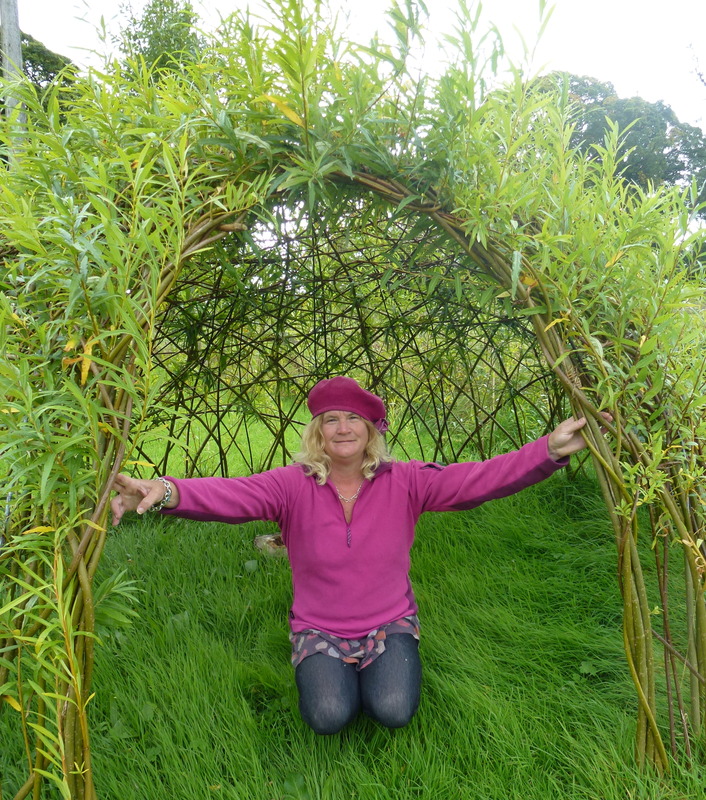 Our willow work has been featured at the Chelsea Flower Show and we worked alongside Kim Wilde to create the award-winning Cumbrian Fellside Garden at Chelsea in 2005. The ease with which willow roots and grows has encouraged many basketmakers and environmental artists to create structures that will become long-term features in the garden or countryside. 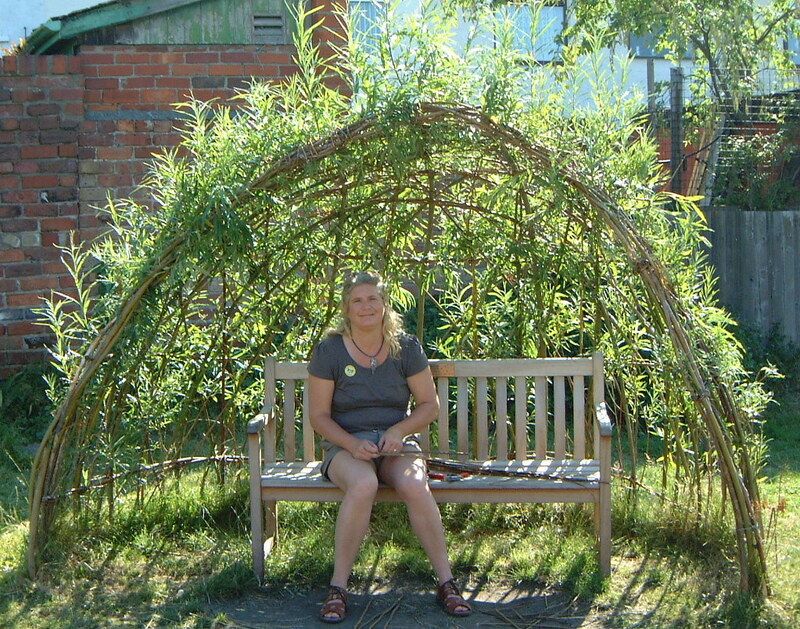 Living willow sculptures are unique as they are works of art that change size (by growing), change colour and texture (leaf growth/fall, bare winter skeleton/leafy summer mass) and encourage wildlife. 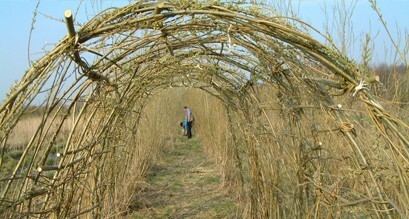 Structures such as tunnels and domes (sometimes called ‘wigloos’ from willow/igloo) can be created out of freshly cut willow rods that are interwoven into the desired shape using basketmaking techniques. As the rods root and grow the structure become stronger with the interlacing rods eventually creating pressure grafts and binding securely together. New growth can be interwoven to replace the original non-living rods that are needed to give stability to the structure in it’s early years. An annual autumn maintenance programme of weaving in and hard pruning maintains the shape of the structure. The prunings can be used for basketmaking and garden supports or dried and made into faggots for kindling. Living willow seats and arbours are becoming very popular as they have been featured in several glossy lifestyle and gardening magazines as well as national television. Hurdles woven out of living willow (often called fedges from fence/hedge) make a good boundary to a garden and can be ornate as well as practical. If the living rods are criss-crossed to form diamond patterns grafting will eventually occur giving the structure even more strength. A big advantage of a living trellis over fencing is that the posts will never rot and blow down in a gale. Willows can also be used for environmental projects where there is a need to lessen the impact of new buildings or roadways. 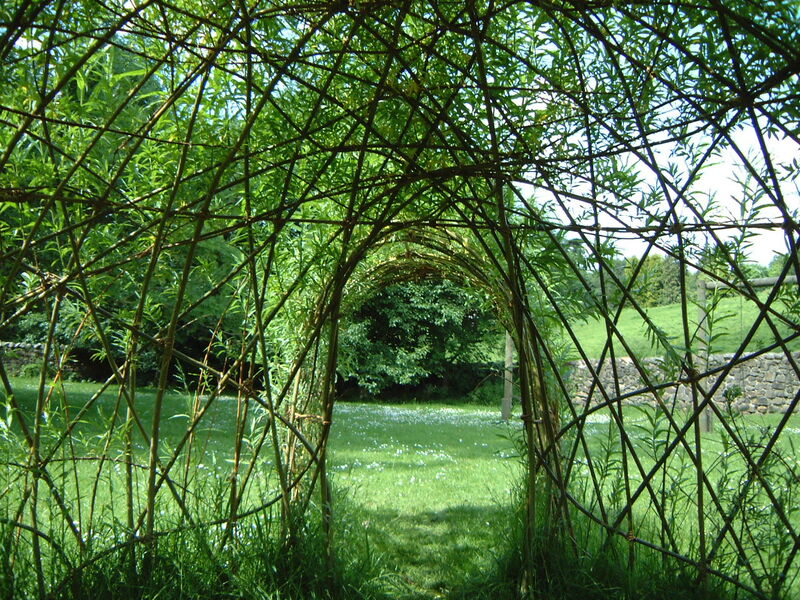 Some European countries have begun to use living ‘willow-walls’ as roadside barriers. The walls absorb traffic noise, are non-reflective and also help to control dust and exhaust fumes. 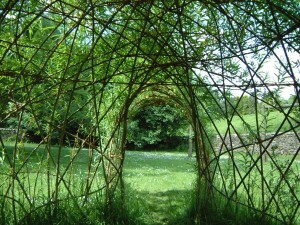 Willow-walls are very durable, virtually vandal-proof and easy to maintain. Willow-walls are constructed by making a wedge-shaped barrier consisting of parallel willow hurdling with a central core of soil. Green willow rods are used to weave the sides and the rods root into the earth core. These walls can be over 10ft high and the earth core contains a perforated irrigation pipe that can be used to keep the soil core moist until the willows have formed an extensive root system. Because willows have widely spreading root systems Salix species are useful in controlling riverbank erosion. Willow roots quickly consolidate soil and slow down the rate of erosion by forming a protective network of woody roots. Some willows are aggressive colonisers with quickly spreading roots and suckers that can rapidly bind swampy ground. 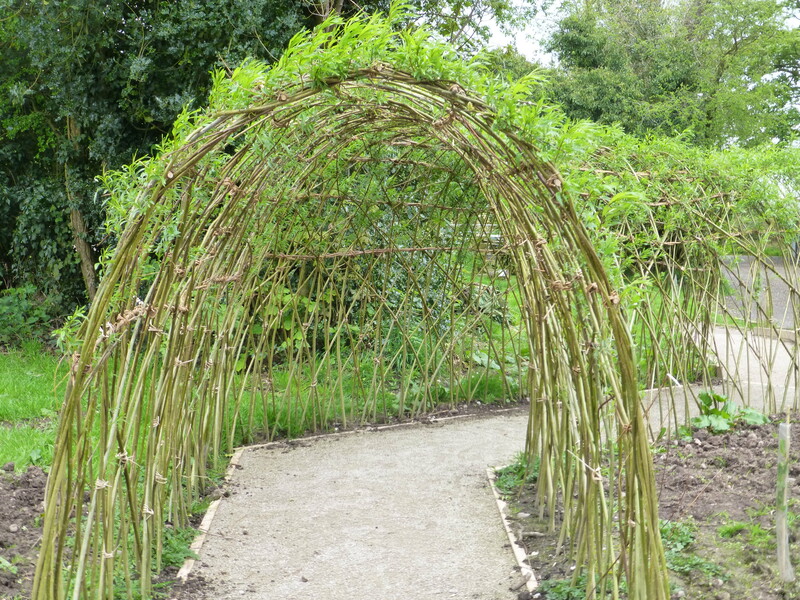 Structures and meshes can be woven out of green (freshly cut) willow and used as the basis for the repair of eroded riverbanks and the stabilisation of slopes. These methods have been used in various waterway reclamation projects. There is nearly always room for a few ornamental shrubs in a mixed garden. Willows can bring beauty to any patch of land. 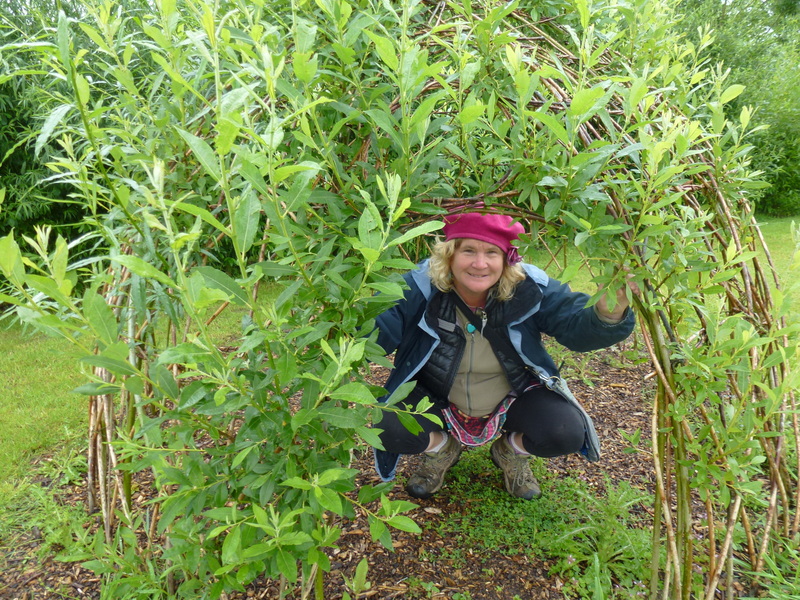 The large Salix family contains trees ranging in height from a few inches to a hundred feet or more. Branches can have bark colours of yellow, red, black or purple. Many willows produce catkins that are colourful at a time of year when spirits are in need of a lift. Small branches picked during the Christmas period and brought indoors will gradually produce catkins. S. alba var. sericea and S. alba ‘Aurea’, the silver willow and the gold-leafed willow have particularly beautiful summer foliage. Twisted willow, S. matsudana ‘Tortuosa’ roots well from cuttings and makes an interesting small tree fairly quickly. One of the most unusual willows S. ‘Sekka’ is prized by flower arrangers as it has wide, fasciated (flattened) stems with long catkins. The violet willow, S. daphnoides produces purplish stems that are covered in a whitish bloom similar to that found on some damsons, these rods are prized by many basketmakers for the colour effects that can be achieved by weaving them together with the orangey branches of S. alba. 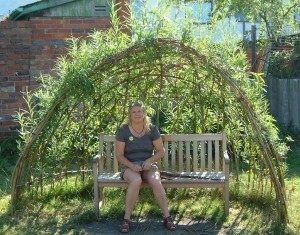 A suitable willow can be found for any type of landscape. The magic bit is that by just sticking a pruning in the ground we can help to rehabilitate industrial wastelands, provide habitat for wildlife and bring a little more beauty to the world.